The WebSocket protocol, described in the specification RFC 6455 provides a way to exchange data between browser and server via a persistent connection. Once a websocket connection is established, both client and server may send the data to each other. WebSocket is especially great for services that require continuous data exchange, e.g. online games, real-time trading systems and so on. There’s also encrypted wss:// protocol. It’s like HTTPS for websockets. The wss:// protocol not only encrypted, but also more reliable. That’s because ws:// data is not encrypted, visible for any intermediary. Old proxy servers do not know about WebSocket, they may see “strange” headers and abort the connection. On the other hand, wss:// is WebSocket over TLS, (same as HTTPS is HTTP over TLS), the transport security layer encrypts the data at sender and decrypts at the receiver, so it passes encrypted through proxies. They can’t see what’s inside and let it through. …And if we’d like to send something, then socket.send(data) will do that. For demo purposes, there’s a small server server.js written in Node.js, for the example above, running. It responds with “hello”, then waits 5 seconds and closes the connection. So you’ll see events open → message → close. That’s actually it, we can talk WebSocket already. Quite simple, isn’t it? Now let’s talk more in-depth. When new WebSocket(url) is created, it starts an HTTP handshake (HTTPS for wss://). 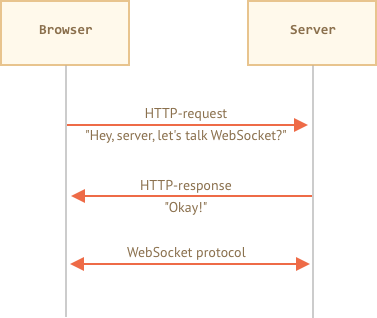 The browser asks the server: “Do you support Websocket?” And if the server says “yes”, then the talk continues in WebSocket protocol, which is not HTTP at all. Origin – the origin of the client page. WebSocket is cross-origin by nature. There are no special headers or other limitations. Old servers are unable to handle WebSocket anyway, so there are no compabitility issues. But Origin header is important, as it allows the server to decide whether or not to talk WebSocket with this website. Connection: Upgrade – signals that the client would like to change the protocol. Upgrade: websocket – the requested protocol is “websocket”. Sec-WebSocket-Key – a random browser-generated key for security. Sec-WebSocket-Version – WebSocket protocol version, 13 is the current one. Here Sec-WebSocket-Accept is Sec-WebSocket-Key, recoded using a special algorithm. The browser uses it to make sure that the response corresponds to the request. Afterwards, the data is transfered using WebSocket protocol, we’ll see its structure (“frames”) soon. And that’s not HTTP at all. There may be additional headers Sec-WebSocket-Extensions and Sec-WebSocket-Protocol that describe extensions and subprotocols. Sec-WebSocket-Extensions: deflate-frame means that the browser supports data compression. An extension is something related to transferring the data, not data itself. Sec-WebSocket-Protocol: soap, wamp means that we’re going to transfer not just any data, but the data in SOAP or WAMP (“The WebSocket Application Messaging Protocol”) protocols. WebSocket subprotocols are registered in the IANA catalogue. Sec-WebSocket-Extensions is sent by the browser automatically, with a list of possible extensions it supports. The server should respond with a list of protocls and extensions that it agrees to use. Here the server responds that it supports the extension deflate-frame, and only SOAP of the requested subprotocols. “text frames” – contain text data that parties send to each other. “binary data frames” – contain binary data that parties send to each other. “ping/pong frames” are used to check the connection, sent from the server, the browser responds to these automatically. “connection close frame” and a few other service frames. In the browser, we only care about text or binary frames. WebSocket .send() can send either text or binary data, doesn’t matter. For sending, socket.send(body) allows strings or any binary format, including Blob, ArrayBuffer, etc. No settings required: just send it out. Textual data always comes as string. For receiving binary data, we can choose between Blob and ArrayBuffer formats. The socket.bufferType is "blob" by default, so binary data comes in Blobs. Imagine, our app is generating a lot of data to send. But network connection is not that fast. The user may be on a mobile, in rural area. We can call socket.send(data) again and again. But the data will be buffered in memory and sent out only as fast as network speed allows. The socket.bufferedAmount property stores how many bytes are buffered at this moment, waiting to be sent over the network. We can examine it to see whether the socket is actually available for transmission. Normally, when a party wants to close the connection (both browser and server have equal rights), they send a “connection close frame” with a numeric code and a textual reason. // event.reason === "Work complete"
The code is not just any number, but a special WebSocket closing code. 1006 – can’t set such code manually, indicates that the connection was broken (no close frame). Please refer to the RFC6455, §7.4.1 for the full list. WebSocket codes are somewhat like HTTP codes, but different. In particular, an codes less than 1000 are reserved, there’ll be an error if we try to set such a code. 3 – “CLOSED”: the connection is closed. Let’s review a chat example using browser WebSocket API and Node.JS WebSocket module https://github.com/websockets/ws. Server-side code is a little bit beyound our scope here. We’re using browser WebSocket API, a server may have another library. Still it can also be pretty simple. We’ll use Node.JS with https://github.com/websockets/ws module for websockets. Create clients = new Set() – a set of sockets. For each accepted websocket, clients.add(socket) and listen for its messages. When a message received: iterate over clients and send it to everyone. When a connection is closed: clients.delete(socket). You can also download it (upper-right button in the iframe) and run locally. Just don’t forget to install Node.js and npm install ws before running. WebSocket is a modern way to have persisten browser-server connections. WebSockets don’t have cross-origin limitations. They are well-supported in browsers. Can send/receive strings and binary data. WebSocket by itself does not include reconnection, authentication and many other high-level mechanisms. So there are client/server libraries add them. But it’s also possible to implement these manually and integrate WebSockets with an existing site. For integration purposes, a WebSocket server is usually running in parallel with the main server, and they share a single database. Requests to WebSocket use wss://ws.site.com, a subdomain that leads to WebSocket server, while https://site.com goes to the main HTTP-server. Surely, other ways of integration are also possible. Many servers (such as Node.js) can support both HTTP and WebSocket protocols.